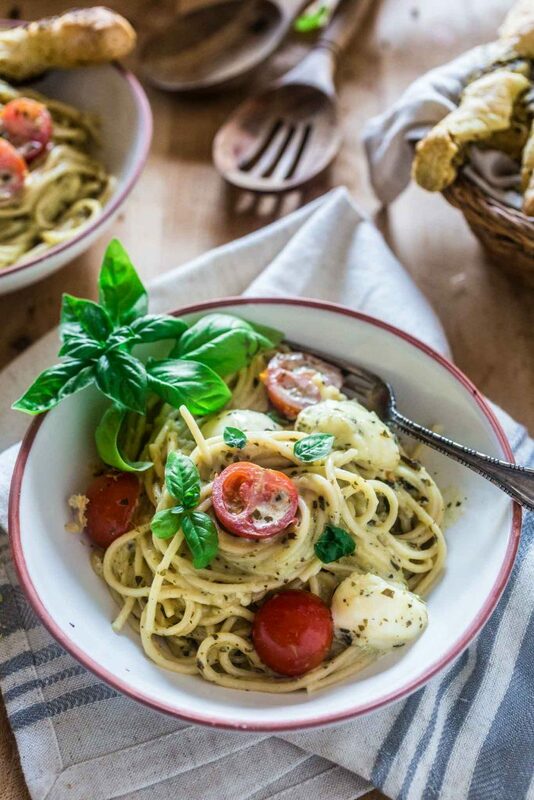 Who can say “no” to spaghetti tossed in a delicious pesto cream sauce topped with fresh cherry tomatoes and mozzarella balls? Not me! Especially when it’s so easy to make and on the table in 15 minutes! Don’t believe me? Just watch the video at the end of this post! Happy Labor Day, friends! The unofficial end of summer is finally here. Can you believe it? How do you feel about that? Sad, mopey and already missing the ice cream season? Or maybe excited for autumn, all things pumpkin and electricity bills that don’t cost the price of a weekend getaway? I think I’m right there in the middle. I am excited for fall, since it’s my favorite season, but I will definitely miss picnicking, walking barefoot on the grass and all the beautiful summer produce. But, hey, chin up! Let’s not cry over bland winter tomatoes yet! There is still time to put together a delicious dish that tastes just like summer with the help of @BarillaUS and #BJsWholesale! It is no secret that I am a huge pasta lover. ❤️ I’ll happily eat pasta a few times a week, all year-round, and I am especially fond of the hearty dishes, like my pappardelle (or fettuccine) alla bolognese. However, there’s something equally great about pasta and fresh summer produce, mostly because there’s usually little to no work involved. 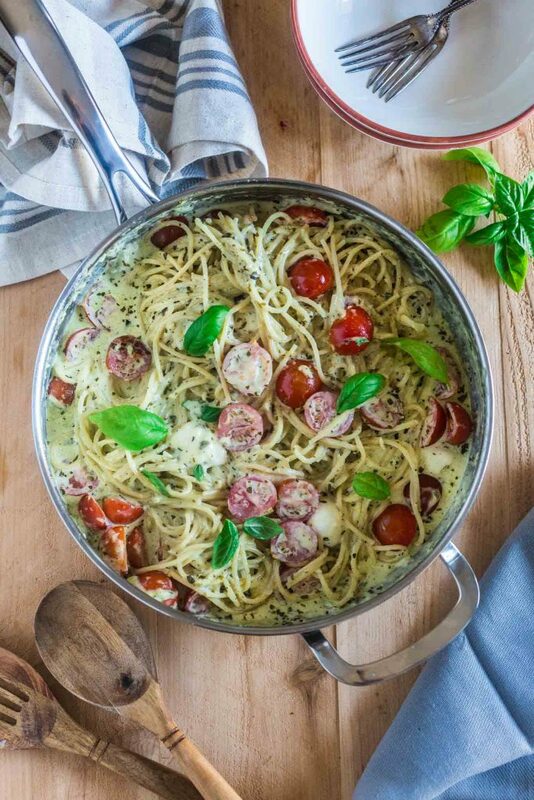 While my bolognese recipe takes over 3 hours of prep + cooking, this summery Spaghetti with Pesto Cream Sauce, Cherry Tomatoes and Mozzarella takes less than 20 minutes. Even less, if you can manage boiling the water and cooking the pasta while you work on the sauce! Now, as much as I love pasta, I cannot stand soggy, overcooked spaghetti. No, can’t do! Sorry, you’ll have to toss it and start again. Or maybe make a frittata or omelette with it, if your heart breaks at the thought of wasting food. Because of my aversion to anything that is not “al dente”, there are a few steps I never skip, so I can have perfect pasta every time. I use a large pot with lots of water. Even if I am cooking just half a package of spaghetti. The pasta needs room to move around, so don’t try to be sneaky and use less water so it comes to a boil quicker. Or your spaghetti will clump together and you’ll end up with a huge mess. I let the water come to a full boil. Again, don’t be tempted to add the pasta when the water is just simmering. Your spaghetti won’t cook evenly and you’ll end up with some undercooked pieces. I ALWAYS salt the water. Yes, even if I’m serving with a salty sauce, like pesto or ragu bolognese. I learned since I was little (perks of having an Italian uncle) that pasta should be cooked in water that is as salty as the ocean. Bland, tasteless spaghetti are as bad as overcooked spaghetti, so don’t be afraid to use a lot of salt (at least a tablespoon). I stir my pasta often. I honestly don’t know how people cook pasta without stirring it at least 3 or 4 times during the cooking time. I find that if I don’t do that, my spaghetti stick together and my dish is ruined. So, while I don’t give it as much TLC as I would for a risotto, I make sure I keep an eye on it, stirring frequently. I save some of the pasta water. Had to learn this one the hard way. A little pasta water will save spaghetti that got a little clumpy after sitting in a colander for a few minutes. It also works wonders by helping the sauce and pasta bind together. I use good quality products. Most pasta dishes are usually simple and rely completely on high quality ingredients. So making sure you buy products from a trusted brand, definitely pays off in the end. My favorite is and has always been Barilla. It is the pasta my uncle used to cook his Italian masterpieces and it’s Italy’s #1 pasta brand. The good news is that Barilla now has a new certified USDA organic line, made with the highest quality ingredients and without any GMO. #BarillaOrganic I bet you can imagine my excitement when I was shopping at BJ’s Wholesale Club and saw the Penne/Spaghetti 6 pack. 6 pounds of pasta (half spaghetti/half penne) at an affordable price? Sign me up, because I am a sucker for anything convenient that makes my life easier. Plus, I love that they provide a variety, so you are not stuck with the same kind of pasta. I also grabbed a few of Barilla’s Traditional Pesto Sauce (which comes in 2 packs at BJ’s! ), because I simply adore pesto. Who doesn’t, really? Especially when it’s made with only the highest quality ingredients, like sweet basil, aromatic herbs and extra virgin olive oil. Because I love pesto so much, I thought it would be fun to serve my spaghetti dish with some pesto twists on the side. Well, I ended up having to make a second batch, because the twists didn’t survive 5 minutes after they came out of the oven. It started with me having to try one, to see if they came out good. Then Tim felt like he deserved one too. And by the time we realized it, they were all gone. Good thing they are VERY EASY to make. In fact, because they are so easy, I won’t even add a recipe card. All you have to do is spread Barilla’s Pesto Sauce to a sheet of puff pastry. I usually add 1/3 cup to one sheet, but you can add to taste. Then, cut the pastry into 1-inch strips and twist each strip 3 to 4 times. Place them into a baking sheet lined with parchment paper and bake in a preheated (400F degrees) oven until golden brown, about 10 to 15 minutes. Voila! An easy and delicious appetizer (or side) for your Spaghetti with Pesto Cream Sauce. Phew! This was a long post. If you made it this far, congratulations! You are a certified pasta lover! 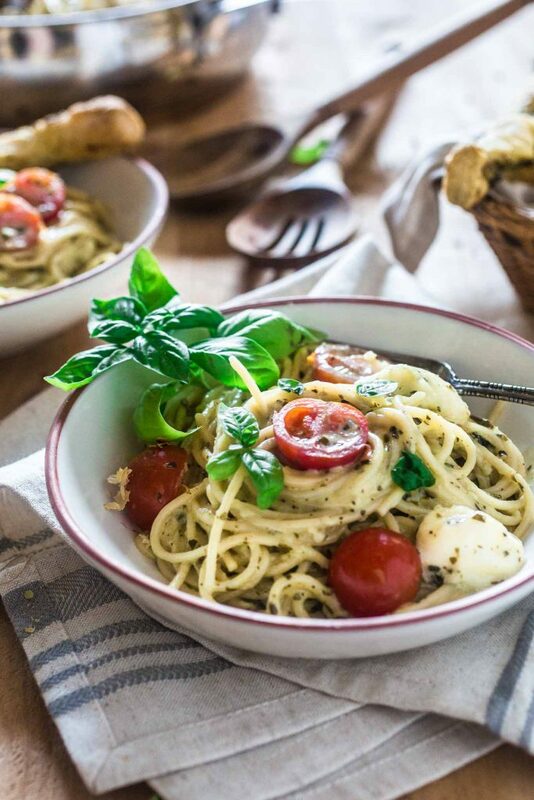 And now, I’m gonna leave you with this quick video I made, to get you excited about making this Spaghetti with Pesto Cream Sauce, Cherry Tomatoes and Mozzarella. Heat the butter in a large sauté pan, over medium heat. Once the butter has melted, add the heavy cream and cook for about a minute, or until it starts to simmer. Stir in the parmesan cheese and cook until dissolved. Then, add the pesto sauce and stir until combined. Taste for seasoning and fix with salt and pepper. Remove the pan from the heat and add tomatoes, mozzarella balls and the spaghetti. Toss everything together, adding a little reserved pasta water if necessary. Transfer to a serving dish (or individual bowls), top with fresh basil leaves and serve immediately, with some freshly grated Parmigiano Reggiano on the side.